After showing signs of improvement in early fall, sales of clothing and luxury goods weakened a bit the first half of November, compared with a year ago, when stores pulled shoppers in with massive discounts, figures released Tuesday show. Electronics sales have grown solidly this month, however, compared with the first half of November last year, when stores didn't discount electronics as much. And online sales, where growth had slowed this year, are roaring back. "It was a little bit softer," said Michael McNamara, vice president at SpendingPulse, referring to the weak apparel and luxury figures. "When you think about the discounts last year, they were broad-based emergency discounting." The big question in the new year is unemployment: at 10.2 percent we're not expected to see a job recovery until the second quarter of next year, meaning it may not be a very happy new year for shoppers and retailers across the country, reports CBS News correspondent Bianca Solorzano. Last year's discounts encouraged consumers to spend more early in the holiday shopping season than this year's more restrained - though ubiquitous - promotions. "While there are some great deals, retailers are in a much better position and are more strategic with their discounting," McNamara added. SpendingPulse found that sales of women's clothing fell 3.3 percent; sales at department stores fell 7.1 percent; footwear sales slipped 1.5 percent; and men's apparel sales dipped 1 percent for the period from Nov. 1 to Nov. 14. Overall apparel sales rose in October after many months of declines starting in July 2008. Luxury sales, which rose in September and October, had shown declines since August 2008. Online sales, where the figures haven't shown a monthly decline since the recession started in late 2007, did taper in the spring. But e-commerce is enjoying a rebound now, with sales up 19.4 percent the first half of the month. Online sales rose 5.2 percent in July, 12 percent in August, 15 percent in September and 18.7 percent in October, McNamara said. McNamara said this year's rising gas prices have helped online sales because shopping online lets consumers drive less. Electronics sales rose 6.1 percent the first two weeks of this month, helped in part by coupons and other enticements that retailers like Best Buy Stores Inc. offered to boost sales. 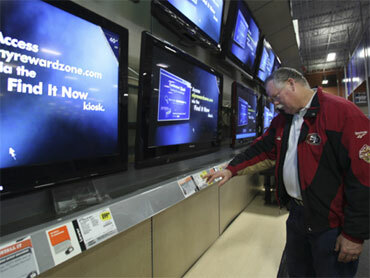 Electronics sales rose 5.0 percent in September and 5.2 percent in October, compared with a year earlier, McNamara said. Major retailers, including Wal-Mart Stores Inc., Sears Roebuck and Co. and Toys R Us already are hawking the kind of deep discounts usually reserved for the day after Thanksgiving, when holiday shopping kicks off in earnest.